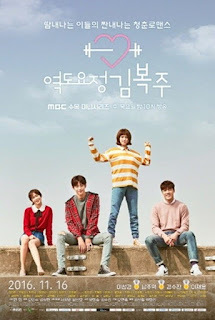 Kim Bok Joo (Lee Sung Kyung) is a student in Haneol College of Physical Education. She has shown strength like no other since she was a child and was influenced by her former weightlifter father. She looks thoughtless at a first glance, but inside she’s as fragile as glass and has deep recognition. Jung Joon Hyeong (Nam Joo Hyuk) is Kim Bok Joo’s best friend. He is a born swimmer but ever since he was disqualified from his first international event, he suffers from ‘start trauma’. Along with Kim Bok Joo, he overcomes his troubles and finds his dream and love. Song Shi Ho (Kyung Soo Jin) is a rhythm gymnast who also attends Haneol College of Physical Education. She started gymnastics since she was 5 and won the Asian Games at the age of 18. She’s always been the best since then but mental pressure caused her to break up with Jung Joon Hyung and regret it. This drama is inspired by the life of South Korean Olympic weightlifter gold-medalist Jang Mi Ran. Sometime after I finished this drama, the dating news of Lee Sung Kyung and Nam Joo Hyuk got out, and I just couldn’t believe how surreal it was. They had by far the BEST chemistry I’ve ever seen in a drama. Okay, I admit I might overreact to this, but I can’t remember a drama were I enjoyed the relationshippy part of a drama so much as this one. Everything else is good too, but you kind of only remember those 2. Lee Sung Kyung has definitely become one of my favorite actress’, she’s so real and talented. A really nice drama about the hardships one may face on the road to success, especially while being in college. Storywise there could have been more in it, but I guess it’s one of those ‘no-major-plot-just-enjoy’ kind of dramas. One of those youth dramas I kind of dig lately. So, I'll definitely recommend this to anyone, despite what your preferences are, I'm sure you'll enjoy it and it will bring you joy.